In his 2014 State of the Union address, President Obama called on Congress to “give American a raise” by increasing the federal minimum wage. For the second year in a row he argued “that in the wealthiest nation on earth, no one who works full time should have to live in poverty”. Even with the presidential priority of raising the Federal minimum wage, the 2014 House bill was voted down. In spite of this, many states and cities have opted to raise the basic hourly wage independent of the federal government. Raising the minimum wage will impact employers and employees alike, and through them the larger society. While fewer than three percent of US workers* earn the minimum wage (or less), 18 percent earn less than $10.10/hour (the amount proposed by the President). Understanding how an increased minimum wage will affect individuals first requires examining common arguments about low-wage workers. Some argue that an increase in the minimum wage would have the greatest impact on students –both high school and college—whose after-school employment represents pocket money or a way of defraying college tuition even as they continue to rely on their parents’ assistance as they finish school. 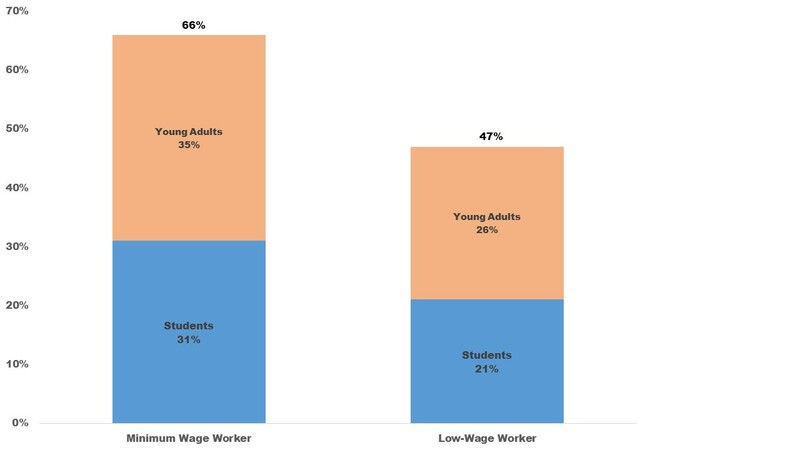 It is true that students are disproportionately represented among low-wage workers, yet they account for only one in five workers earning less than $10.10/hour. Low-wage workers are young adults at the beginning of their work history. Young adults, early in their careers, will benefit from increased experience, not government intervention, to raise their wages, according to this argument. Yet when students and young adults (18-25) in the work force are taken together, they represent only roughly half of all low-wage workers. The other one-half is not comprised of young adults who have many more years in the workforce to increase their experience (and presumably their wages). Low-wage workers are parents living in poverty. Low-wage parents, doing their best to support their families, make a compelling case for raising the minimum wage. President Obama prefaced his call for increasing the minimum wage by saying “no one who works full time should ever have to raise a family in poverty.” And it is true that low-wages may be particularly difficult for parents to shake as they juggle work and family responsibilities. However, this can be misleading: only about one in four low-wage workers is a parent living with young or school-aged children (although many parents not living with their children continue to bear financial responsibilities to them). Furthermore, only half of low-wage parents live in or near poverty. 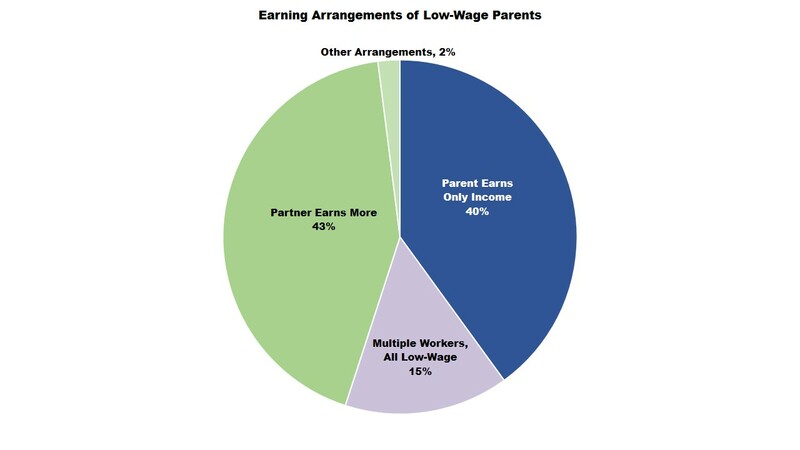 Most low-wage parents have help paying the bills from other workers living in their household. For parents with shared financial responsibility, the median household income is roughly $51,000. The low wages of these parents is crucial to the financial health of their families even when other family members earn more. For the two out of five parents who are the only worker in the home, their median household income is around $20,000. Almost 20 percent of all hourly and salaried workers earn less that $10.10 per hour. While they have low wages in common, their lives and financial situations are so diverse that accurate predictions about universal impact of raising the minimum wage are hard to come by. For some workers, an increase may be a passing benefit as they work their way through high school or college. For some adults, an increase provides additional—but perhaps not essential—funds earned to supplement household income. However, for at least one-half of all low-wage workers, their earnings are the primary income for their household, or are supplemented only by other low-wage earnings. The demographic characteristics of low-wage workers demonstrate that any decision to raise the minimum wage will impact more than parents, students, and young adults, and will likely provide a more secure financial footing for a sizable minority of Americans. For more information about low-wage workers, check out the Census Brief series: Low-Wage Employment. Also, check out our other Census Briefs on Virginia’s Immigrants, Snap in Virginia, and Aging and Migration in Virginia. * Based on calculations using the Minnesota Population Center’s IPUMS data, Current Population Survey Outgoing Rotation Group Microdata, March 2013. Analysis done on all employed, working individuals. Following the Bureau of Labor Statistics, these numbers exclude self-employed and agricultural workers. All of the analysis of individual income is based on workers’ earned income, and does not take into account income from sources outside of the labor market, such as welfare or disability benefits or retirement income.